To order this holiday brochure for FREE delivery to your home or computer, click the GET THIS FREE button. "The trains in any country contain the essential paraphernalia of the culture …"
"This new venture 'on the rails' comes from a growing interest in unique themed journeys and a desire to share the experiences and knowledge I have gained over the years. I get a buzz from creating captivating itineraries; they open doors to places, products, and people not normally available on 'standard' tours. Please join me on one of these tours, or perhaps you'd like me to build a personalised itinerary for you. After all, one could argue that there's no better way to see the world than from the window of train." Tour Leader and Director Scott McGregor has been involved in the media for over 30 years as an actor, presenter, writer and producer. 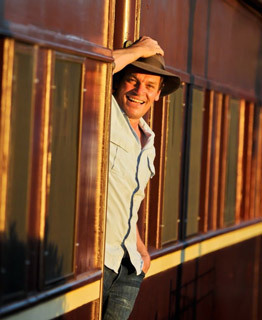 Graduating from NIDA in 1979, he appeared in a wide range of stage, film and TV roles and has presented and hosted numerous ratings winners including two series of his own Railway Adventures. Over the last decade Scott has hosted more than a dozen highly successful tours to destinations such as India, Russia, Japan, Queensland and Eastern Europe. He also operates 'Ruwenzori', his Orient Express style tourist retreat near Mudgee, NSW. The joy of travel is not confined to the destination. How you travel is a large and rich part of the experience. Railway Adventures offers a truly unique perspective on some of the world’s most spectacular holiday destinations, with the confidence that the journey will be just as magical and memorable as what you find at the end of the line. Unique itineraries — each itinerary has been meticulously developed by a team of expert travellers with many years’ experience, an intimate knowledge of the destination, and with great cultural awareness. You are guaranteed to experience the best that each destination has to offer. Authentic local experiences — whether it’s a little-known yet impressive steam railway, a small boutique hotel or an authentic restaurant, you can be sure of experiencing something special on these tours. Expert local guides and operators — Railway Adventures employs local guides to share their passion and knowledge of the places they call home, while partners on the ground provide the best possible support and backup all the way. Small group sizes — a small number of guests per trip guarantees an intimate experience with less time spent queuing, more time with your guide, and better access to sightseeing destinations. Fully escorted – tour leaders are experienced and capable, entertaining and considerate, and together with local guides have your needs well covered. They help with everything along the way, providing peace of mind, and enabling you to relax and enjoy the journey. And you’ll find them jolly good company, to boot! Customer satisfaction — Railway Adventures testimonials speak for themselves. Customer satisfaction ratings show that over 97% would recommend Railway Adventures to others. Variety is the spice of life on the rails and that is what you’ll get in spades with Railway Adventures. Character-filled, zig-zagging railways of Sri Lanka, opulent hotels on wheels in India and South Africa, steam heritage trains in some of the most staggeringly beautiful parts of the world, dinky little carriages in outback Queensland, bullet trains in Japan— if it travels on a rail track, Railway Adventures is there! It’s not just the trains, boats and planes; it’s the warm, comfortable beds at night, the culinary delights, the immersion in a new culture and the people you meet that makes travelling so enjoyable. Railway Adventures strives to create the most intriguing and memorable itineraries, with hand-picked hotels, restaurants, local guides and cultural experiences to make sure you experience the best possible rail journey in a safe, comfortable and pleasurable way. This brochure covers the regions and holiday types listed below. Click on the links to see more free travel brochures covering the regions and holiday types you are interested in. People who ordered See Your World By Train also ordered the free travel brochures below. Click on the images to find out more about these brochures.